Additional two adjustment point of air flow and air spray volume at the back and the bottom compared to the HS-30. As Single- Action is called an airbrush, if only the air volume is regulated with the operating lever and the paint volume with another regulator. 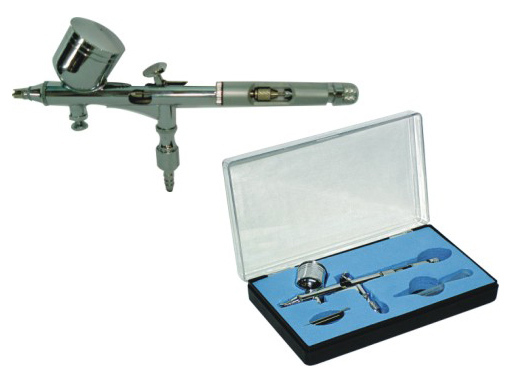 In the case of Dual-Action airbrush this happens with a lever: by pressing down the lever the user regulates the airflow, by retracting it (simultaneously) you can determine/adjust the paint volume. By pressing down the control level the compressed air flows forwards, out off the needle cap. First, only when the control lever is pulled back does the paint come out of the nozzle and is sprayed on the object due to the air pressure. The more one pulls back the control lever, the more paint is sprayed. This requires some practice, but nothing can prevent that the air flow regulation is carried out via compressor, so that it is recommended to use a dual-action airbrush from the beginning. The maximum paint amount can be set at the back of the gun via the knurled screw (paint amount-adjusting screw).